Learn more about our suite of 5G & LTE products that support LTE ASN.1-based protocols, as well as NAS. If you are new to ASN.1 and want to find out more about it without going too deeply into technical details, check out our short ASN.1 overview with simple examples and explanations of ASN.1's most common features. The OSS ASN.1 Tools for C, C++, C#, and Java now support the ASN.1 JSON Encoding Rules (JSON ER), which enables you to create and parse JSON messages. Download a free evaluation and try JSON ER with your ASN.1 schema. You can't live a day without using ASN.1. When you use your cellular phone, manage your network, shop online, receive your FedEx package, send secure emails, place an 800-number call, or engage in any number of daily activities, you are using ASN.1. Test drive the OSS Nokalva ASN.1 and LTE Tools now! Your trial includes everything you need to get started—software, documentation, sample programs, free 24x7 technical support, and more. March 2019: The OSS NAS Encoder/Decoder Library is now available for Java. January 2019: Support for 5G is available for OSS' NAS suite of products. The OSS ASN.1 Tools supports all 3GPP releases, including all new 5G protocols. May 2018: ASN1Doc is our new online tool available on ASN.1 IO. Use ASN1Doc to generate HTML documention about your schema. 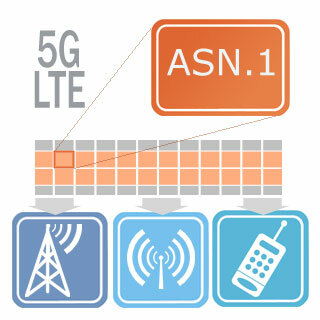 February 2018: The OSS© ASN.1 LTE solutions now support LTE Positioning Protocol A (LPPa).